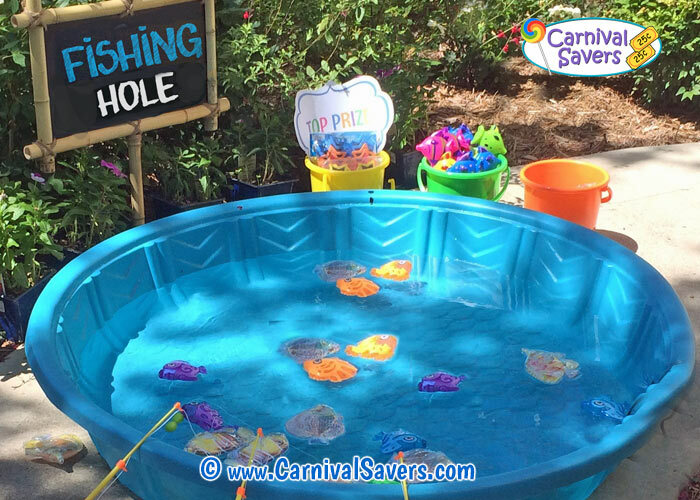 Carnival Game Idea - Magnetic Fishing Hole! Add some Fish-Themed Prizes to this Game! Add Numbers with Marker on One Side of Fish. 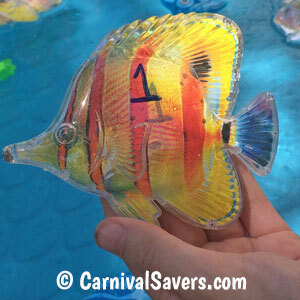 Before your carnival, add different numbers one one side of your fish using a permanent marker. For example, you can mark numbers "1", "2" and "3" on each fish if you have prizes that are designated a "1", "2" and "3" value. If you wish to have some "top winners", maybe choose a number (for example, number 3) to coordinate with the top prize and have a few less "number 3" fish to make the top prize more difficult to win! For example, if you purchase 2 Magnetic Fishing Sets, you will have a total of 14 fish. Select just 3 of your fish (all different types) to have the top prize number of "3" and the other fish will have the numbers 1 or 2 so the chance of winning the top prize is statistically more difficult. We have found kids are smart! If this game is for a large school or fundraising carnival, that goes on for hours, you may wish to buy at 4 - 5 sets so you can mark one of each variety of fish with the top prize number and rotate a few the "top prize" winning fish in and out of the game so kids do not memorize the type of fish that have the winning numbers! Next set up your prize buckets with numbers "1", "2" or "3" and place the prizes in each bucket - ready for carnival players! Because this game includes water - you must have an adult present at all times after you fill water in the pool. If you cannot have an adult, this game can be run without the water. Just add the fish to the empty pool - the kids still love it! Carnival players are given a magnetic fishing pole with a chance to "catch a fish" and see what number the catch! When carnival players reel in their fish, they look for the number that corresponds to the prize they win! Note: Kids love to play this game, and it can take a few minutes to line up the magnetic fishing line with a fish mouth to make a catch! One more thing... If this is for a small birthday party - 12 or less guests, one Magnetic Fishing Set will work just fine. But, if you have more than 12 children we recommend that you have at least two fishing sets so two children can play this game at the same time to prevent a lone line and lots of waiting at this game! For carnival with 100's of guests, consider purchasing at least 4 - 5 sets so you have more fish and many children can play this game at the same time! Not just for kids! We have had a customer call and tell us she used this Magnetic Fishing Toy at a convention her company attended for adults to win door prizes at their booth and it was a hit! She even choose many of our fish themed toys - see some examples below - and the adults love it! Safety Note: If you use water for your game - have an adult present at all times and when finished, drain the pool of all water. 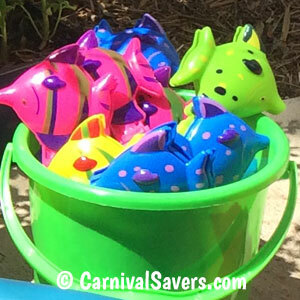 Please follow the Consumer Products Safety Commissions Guidelines for any carnival game that has water. Click here to learn more! REEL IN the BIG ONE with GAME SUPPLIES & PRIZES BELOW!